"(Halladay) looks real good. He looks strong," Manuel said of his two-time Cy Young Award winner, who missed almost two months last summer to a right shoulder injury. "I could tell he’s been doing some work with his upper body, his back and shoulders. He looked a little bigger and stronger. ... Halladay of course has thrown a lot of bullets. But at the same time, too, I think the time he’s had off and the conditioning program he’s been on, if anybody can bounce back and do it, I think it’s Halladay." Being that Zoo With Roy is the world's foremost bolg about wanting to go to the zoo with the Philadelphia Phillies ace pitcher-- and two-time Cy Young award winner-- Roy Halladay (visit us online at zoowithroy.com), we couldn't rest with just word alone. 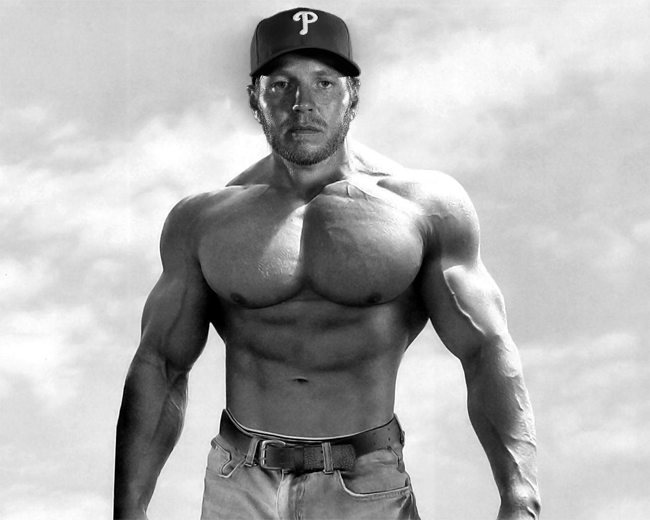 So I dispatched some of my sources in the Clearwater area to a few of Halladay's more well-known fitness haunts, and by good fortune we were able to snag a photo that corroborates what Charlie noted. Check it out for yourself, I think you'd agree that the change in physique is somewhat noticeable. Man I am so looking forward to this season! Roy's angry, you donkeys!!! The body looks like the late Michael Martinez before the accident.